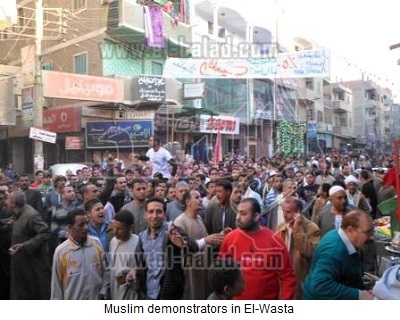 (AINA) -- Hundreds of Muslims marched for the second day through the street of the Egyptian town of El-Wasta, 90 kilometers south of Cairo in Beni Suef Province, to protest the disappearance of a young Muslim girl, Rania Shazli, and accuse the priest of St. George's Church in Wasta of using black magic to lure her to Christianity. The girl's uncle lead a group of Muslims to force the Copts in town to close all their businesses until the girl is brought back to her family. Coptic owners who refused were forcefully shut down. The Shazli family, supported by local Salafists, threatened to kidnap a Christian girl if their daughter is not brought back and vowed to destroy the church after prayers on Friday, March 22nd. During yesterday's march a number of Muslims hurled stones at St. George's church. They had intended to stage a sit-in in front of the church, but were persuaded by some Muslim elders to dispense. They also hurled stones at Coptic-owned homes. The demonstrators roamed the streets of the city starting from the home of the girl and chanted "Why are you keeping silent, is she not like your sister." The church instructed Copts to close their businesses after a delegation of Muslims and Christians went to the Police Department after security failed to find the girl. Security Directorate in Beni Suef had sent forces to secure the church, after threats to the priest and the Copts were received from the girl's father, Hatem Kamal El-Shazly. Rania, a 19-year-old college student, disappeared three weeks ago. Her father accused the priest Father Makkar to be behind his daughters Christianization through "black magic," by means of some special bible readings and smuggling her out of the country. The priest was threatened through loudspeakers all over town. Watani newspaper reported that Rania has sent an open letter to her family, which she posted online, explaining that she ran away from home because of family problems, including sexual abused by her uncle some years ago, and because she was to be forcibly married to someone she did not want to marry. She added that she left Egypt and is married to a Muslim man. Maj. Gen. Ibrahim Hodeib, head of Beni Suef Security, said the girl has contacted her father more than once to inform him that she is out of the country and married to a Muslim man named Ahmed. He added that security forces are stationed in front of the church buildings, and warned against rioting, and that he would deal firmly with any violation of the law.